Timber and Iron always compliment each other well. Furniture is the obvious choice for mixed media items, although it works well in gates and fencing too. 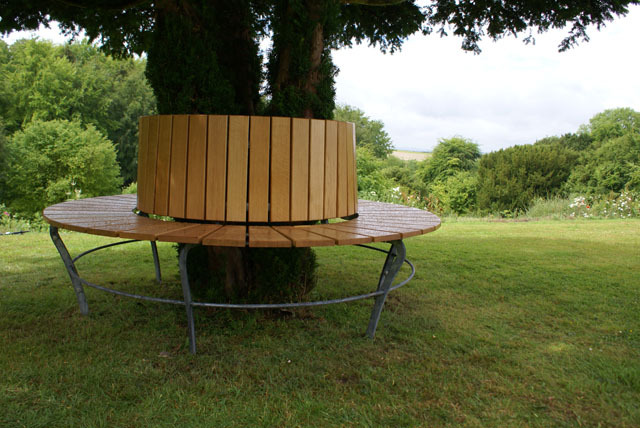 The Tree seat featured in this article is one we designed , made and eventually fitted in June 2011. The brief was to design a light looking seat (‘As if floating!’ I think the client said) but to use wood as the seating material, that’s not an easy trick to pull off, timber alway adds visual weight, so you have to offset that with good detailing and light colouring. The Ironwork is fairly simple as is the timber slats that make up the seat and back rest. 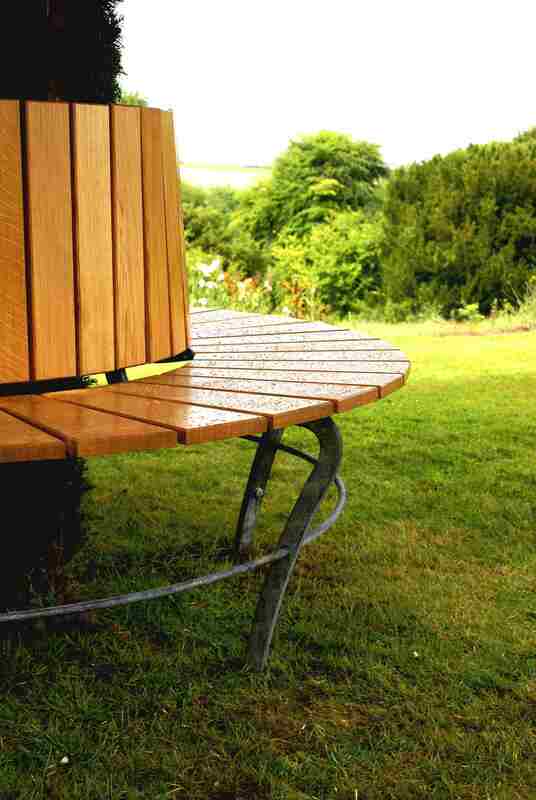 The seat slats are tapered to match the radial development of the circular bench. The timber was selected and machined perfectly by my good friend James Steer, from Oram Joinery. As with the Sime Memorial Bench we installed last month, the timber we chose is a tropical hardwood called Iroko, which is a bit like teak. It is very stable and looks great when it is oiled. We use a horribly expensive product called Osmo oil which is organic, so its impact on the environment is minimal.The oil does the job well, although it does take 4 -5 days to dry properly when you first apply it. The metalwork was galvanised and phosphate washed, as a lot of our outside work is, giving a maintenance free finish. The timber will have to be cared for and recoated in the Osmo oil from time to time but thats the difference between wood and galvanised metal! Tree seats always offer great photo opportunities as you can see, despite being in the shadow of the tree and on an overcast, showery day, the beautiful coloured timber sets it off a treat. Here’s a photo of the whole thing. Thanks for your feedback Kate, I’ve had a look at your pages too, lovely stuff. You have a good eye and your kind comment means more. Next The Batsman Gate and Railing, Guildford, UK.